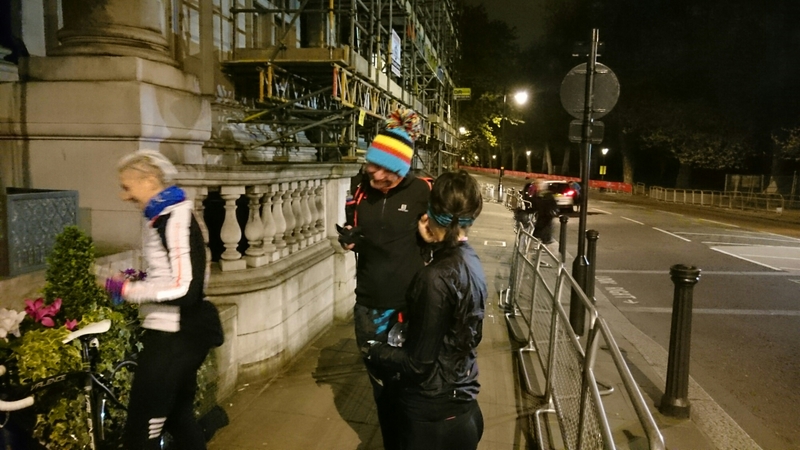 The alarm woke me at 2.30am on Sunday, and with my 3 hours of sleep I rolled out of the inflatable bed, changed into running kit and hailed a cab to get through the streets of central London, heading to the meeting point. The meeting point was obscured by scaffolding, London Marathon bunting and temporary fences, so I had to round the final corner on foot before I was spotted two other people, in running kit, huddling in the porch of the agreed rendezvous point, out of the cold. 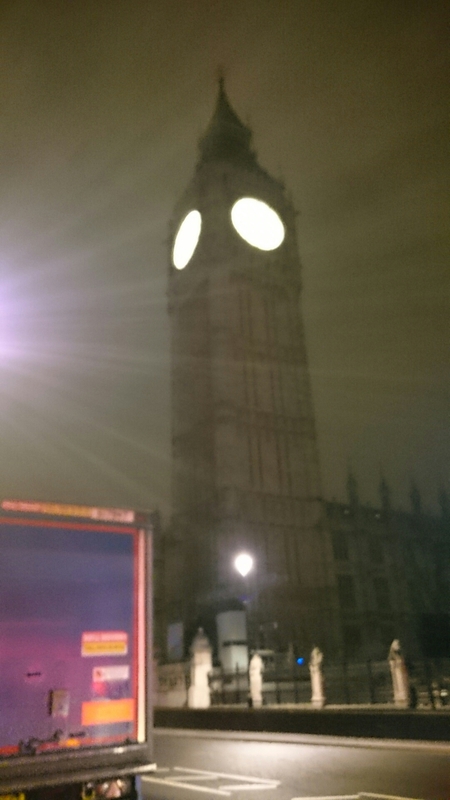 “So, what brings you out to run a marathon from finish to start, in the middle of the night?” I enquired. The first guy said he had flown in from the States, and lacking an entry to the race, decided to join in this unofficial run. The other gentleman introduced himself as the founder and coordinator of this non-event. He wouldn’t be running, but making sure the waves of runners set off on time, all aiming to reach the end (the start of the London Marathon route) at 8am. Over the next few minutes, more runners turned up, and shortly after 3.30am a small group of us set off on our 26.2 mile jaunt through London, bathed in the city’s perpetual glow. It was cold, but we talked and shared stories as we made our way down Embankment and towards Canarfy Wharf. Time flew by, and we soon found ourselves running round the Isle of Dogs, closely following the marathon route. At one point it hailed on us, but only gently. Each of us was self-sufficient, with food, water and extra layers – a key difference to organised events where I often end up with more energy gels at the finish line than when I set off! We crossed Tower Bridge, more or less the half way point, at all exactly the right time. The founder of this event met us with snacks and water, which was a thoughtful touch, unthought unnecessary due to our fully lstocked backpacks. If you’ve done the maths you will notice that we weren’t going particularly fast, but I was treating this as a training run for an ultra, and I think everyone was enjoying the company and novelty of being out at this hour. The second half of the run followed much like the first, miles churning on by, as the eerie city glow was slowly replaced with natural daylight, and hail turned to intermittent rain. As we got closer to the finish/start, teams of volunteers were busy setting up water stations, last minute roadblocks were being set up and an errant van was being towed away. Only in the final four miles did our merry little band spread out, and in ones and twos we finished the run near the marathon start line. It was an unceremonious end to the run, but then again, it was an unceremonious run: I like to think the people who saw me at the bandstand near the Green start thought I’d just been warming up before the official Virgin Money London Marathon. We regrouped in local cafes around Greenwich. The coordinator of the run said about 100 runners did the run this year, up on 90 from the last, and there were about 20 of us in the cafe I ended up in. 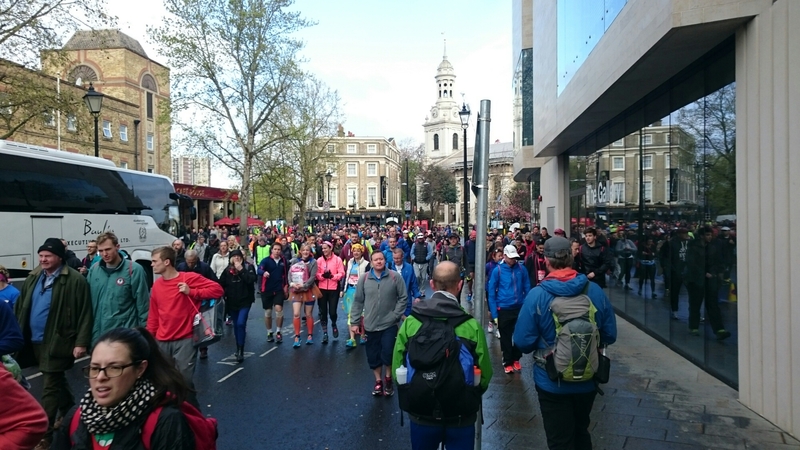 He intentionally kept the run ‘underground’ so the numbers wouldn’t swell and disrupt preparations for the actual VMLM race. After breakfast I made it home in time for a full Sunday of ‘normal’ activities, and even managed to catch some of the euphoria of the VMLM race on social media. I think the run worked because of the small numbers and participants’ self-sufficiency. I hope to find more ‘underground’ runs on the future!